How Much Starter Do You Really Need To Make Yogurt? If you like to make your own yogurt, have you ever questioned your process? Recently, I received the following question from a reader: How Much Starter Do You Really Need To Make Yogurt? What follows are the results of my experiment to determine the optimal amount of starter needed to make good yogurt at home. One of my favorite pastimes in life is questioning why we do things the way we do. If the reason doesn’t make sense to me, I look for a faster, cheaper, better, or more efficient way to do it. Before I get too far into this, here is a look at the way I make basic Greek yogurt just so we have a starting point. The following question from a reader caused me to wonder if tradition or perhaps a cook’s insecurity (if some is needed, add more for good measure) might be the reason there is so much discrepancy across the web regarding the amount of starter needed to make yogurt. I was inspired to experiment. I staged an experiment to see how much yogurt I really needed to make yogurt. The Process for discovering How Much Starter Do You Really Need to Make Yogurt? In the first trial (seen above), I added different amounts of starter ranging from 1/4 teaspoon to 1/2 cup for a pint and a half of milk (3 cups). 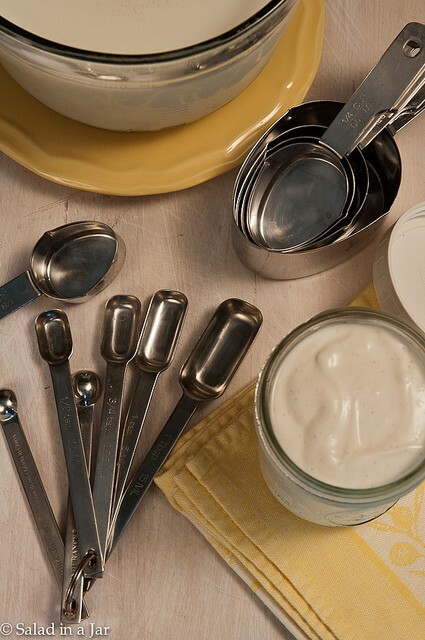 As you can see from the picture above, they all made yogurt–even the 1/4 teaspoon. Notice all the whey sitting on top of the yogurt in the green plate row where I added larger amounts compared to the bottom row. When I dumped the contents of each sample onto a flat plate, the contrast was dramatic! Look how much smoother and creamier the yogurt looks on the right where only a small amount of starter was added to the milk. I combined the top row of yogurt samples containing a lot of starter and the bottom row containing much less to make Greek yogurt, my favorite. After straining and whipping, you can see the result below. WOW! Which one looks more appetizing to you? Surprisingly, the yogurt on the left is still quite edible and tasted just fine even if the texture was not so smooth and creamy. Does incubation time make a difference? Then it occurred to me that time of incubation could also make a difference, so I tried again. This time I used 1 quart of non-fat milk for each sample and my own yogurt as a starter with amounts ranging from 1/4 teaspoon to 1/4 cup. I didn’t even try the reader’s suggestion of 1 cup to 8-9 cups as I could already see that was overkill after my first experiment. 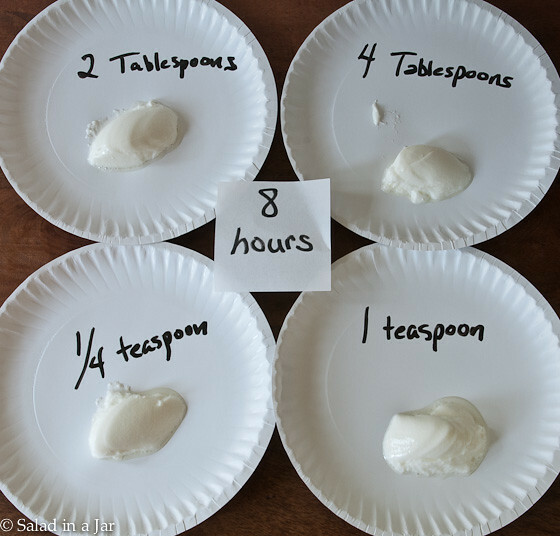 At four hours, they all made yogurt except for the 1/4 teaspoon. It is obviously a little too thin, especially if you want to strain it for Greek yogurt. It’s not obvious in the picture but the 4 tablespoon sample is already not as creamy. I put them all back in the oven to incubate longer. At 6 hours, there is not much change except for the 1/4 teaspoon sample which is now nearly as thick as the others. After 8 hours of incubation, the 1/4 teaspoon sample is just as thick as the 1 teaspoon sample and the creamiest. I tasted them all for tanginess and really couldn’t tell much difference. Many yogurt instructions will tell you the longer you incubate, the thicker your yogurt. I’m not so sure. 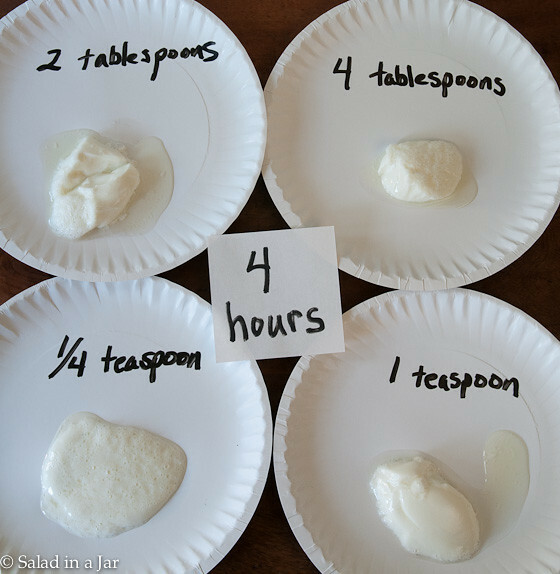 Except for the 1/4-teaspoon sample, they were all thick at 4 hours and didn’t get any thicker, even when incubated an additional 4 hours. For 1 quart of milk, 1 teaspoon of healthy starter is plenty. In case you’re wondering, I always use fresh milk from Braums. It makes the best yogurt EVER. I used a previous batch of my own homemade yogurt as the starter (1 week old). Using a different kind of milk, starter, or additives such as powdered milk or gelatin will most likely yield different results. 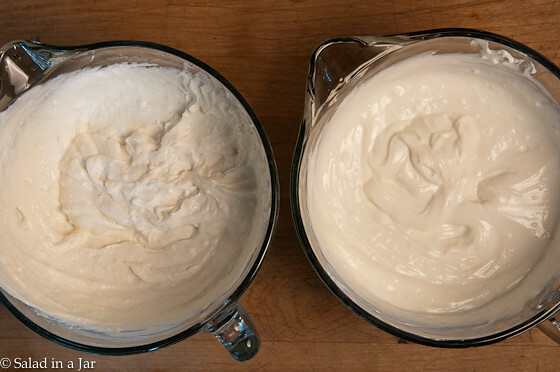 Making yogurt is simple, but the results from using various techniques and ingredients can be complicated to predict. Have fun experimenting! What Can I Do with Failed Yogurt? This was exactly what I needed! Thank you, Paula, so much for your clear and informative research with results in images. I’ve been making yoghurt for many years, with quite variable results. The extent of the whey layer was always present. I never thought to reduce the amount of my starter. I used the quantities shown to me by a friend so many years ago. She used her own milk from her home dairy cow. I just assumed that it was the variability of milk quality that I was buying. Since last November 2018 after reading your article, I have used just 1-2 dessert spoons (instead of 3) of starter from the last batch of yoghurt and it has come out perfectly every time. No layer of whey anymore. Perfectly creamy. I make a batch of 2 litres every five days, using the New Zealand designed EasiYo containers. Just fill with boiling water and insert the filled yoghurt pots. Leave overnight. I have always used the UHT milk in cartons, adding a couple of tablespoons of milk powder and brought it up to heat checking with my finger. If there is a slight foaming around the edges and I cannot bear to leave my finger tip in the milk for more than a few seconds, and never bringing to boil, the temperature is perfect. I then cool the milk down to blood heat. Once again, if I can bear to leave my finger tip in the cooling milk for the count of ten it is perfect to add in the starter. If I have to pull my finger tip out at seven seconds it is too hot still. 🙂 I speed this up a little by putting the pan into a sink of cold water. I do treat my yoghurt starter with delicacy! Stirring it until smooth and gently spooning the warmed milk in to acclimatise the beasties to their new environment, then introducing them gradually to their new home in the pots. Every single batch I’ve made since reading your article has been prefect. I’m so happy! Thank you for your efforts and sharing them with the community. What an interesting letter!! I love the way you check the temperature. Certainly cheaper than a thermometer. Sounds like you have it down to a fine science. I knew about the graininess that boiling causes but have never tried your trick to redeem it. Since I heat mine in the microwave I never have to worry about the boiling. You know what else causes graininess? Additives in the starter. I wrote about it here. Sounds like the yogurt beasties get the royal treatment at your house. Can I come live with you? Ha! I just dump my active yogurt beasties in cold. They’ve never complained yet. Your story about your friend and the amount of starter is classic. If you don’t mind, I may quote you in my article about starter. Before the internet, seems like we all learned to make yogurt from family or friends. So of course, they will do it the same way they were taught. I noticed many discrepancies about the amount of starter needed in recipes across the net and set out to learn the truth. The results surprised me but I’m glad. I would rather eat it instead of using it for starter. Thanks again for writing. Happy yogurt-eating! Thank you for your reply Paula. You have some excellent points about the graininess possibly being due to additives in the culture. I have used a reliable source here in Aus to initiate the first batch (Farmer’s Union Greek style full cream yoghurt, guaranteed just milk, cream and cultures) but from there it has been my practice to save a little of the precious yoghurt batch to use in the next brew. It’s very consistent and lasts all year, through the years. When I tried to brew a batch of yoghurt in the UK it was a terrible failure. I used the exact same technique but, obviously, a bought culture. I checked that it was ‘live’ but took no notice of ‘extras’.? so that may have been the problem. It either didn’t set at all or was so grainy and unpalatable I threw out it. I did miss the ritual and joy of the beasties making it for my own home made batch. The use of one’s own body temperature is so simple, portable and can be used anywhere. It seems infallible so far. ? There’s a little addition to the story of received wisdom from family or friends. I just spoke to my friend last week, the one who gave me the original quantities, and she’s been having problems with her batches. She blamed it on the new cow she was milking, poor thing, I told her about your experiments and we agreed that we have both gone with the mantra “a little extra won’t hurt”! So the idea, which you have started with your meticulous trials, that it is the starter amount that dictates the creaminess, has an ongoing impact. ? Well done! I had not found any other online source for an explanation of that extra whey problem. In the past I did try brewing my own sourdough starter for home made bread. It was very successful and delicious. But I couldn’t maintain the starter regularly. When it was left (in the fridge) without feeding with fresh flour and water regularly, it also produced a greyish liquid layer on top. This was described online in various places as a by-product or waste when the yeast doesn’t have enough food to process and it just eats itself. I wonder if it is possible that when we add too much starter to our milk there is a competition for the ‘food’ and the whey is a by-product of the yoghurt beasties (baccilli) being hungry? Just a thought. I drink it anyway as it’s all good protein. It reminds me of Dutch Karnemelk (buttermilk) a refreshing drink I recall that we had as wee children in Holland before we migrated. I am still gradually reducing the amount of starter because I’d rather eat it, too, than use it for starter. ? This was a great read. Making yogurt seems so simple but it can get a bit complicated when you try to reach a specific standard. Thanks for writing. Dear Paula, as a university student in a fod and human nutrition degree, I am working on a yogurt related assignment, I have found your experiment most helpful. can I please use your pictures in my assignment? I will obviously reference them as being yours and supply a link to this page? Yes, thank you for asking. Hope you get an ‘A”. Love this, thanks so much. I’ve been making yogurt for years, always using a bit from my last batch unless something has gone wrong with it. I’m pretty slap-dash on quantity of yogurt starter to my milk: always a half gallon of milk, a couple of rough tablespoons full of yogurt. I’m rigid about getting it out at 6 hours though, since I like my yogurt mild, not tangy. Sometimes that makes it difficult to find time to make it…. would be ideal to make at night and leave overnight, but usually that’s too sour for my tastes. Now I’m going to try it with a half teaspoon of yogurt, and leave it overnight. I’m betting that the smaller quantity of starter, since it needs longer to grow/populate the milk and convert it to yogurt, will be just right and give me a mild batch, while accommodating my make-it-easy mantra of letting me do it overnight. You are a girl after my own heart. I’m actually pretty “slap-dash” about the starter, too. A spoonful here, a little bit there, or whatever is left in the jar. Hoping your experiment works out for you. Another way to make your yogurt more mild tasting is to strain it as much as possible–for as much as 3-6 hours or even more. If yogurt is too thick for you, add some cream or milk to make it the consistency you like best. Happy yogurt-eating! I’m so glad you reported back. Thanks for verifying my research. Yay!!! Happy yogurt-eating. Any advice for goat’s milk? I have no experience with goat milk/yogurt other than eating it a time or two. So sorry. After umpteen batches of delicious yogurt using a little plain yogurt as a starter, I tried my first batch using whey instead. I accidentally used 6 Tbs instead of 4 for 1/2 gallon of milk, and my usual 8 hours incubating. Unfortunately, I got slightly-thick-pretty-tart-milk instead of my usual yogurt. Could my whey have been too old? I meant to grab “last week’s” batch but instead grabbed the prior week’s. Why was that even still in my fridge? 😛 Can I make frozen “yogurt” with the otherwise wasted milk? If your yogurt still smells OK, try again and go back to your plain yogurt starter. See this post. I haven’t tried making ice cream with failed yogurt because it almost always works just to try again. Hope you see this soon enough to do that. Love your blog!! Just started on my yogurt adventure. It was a little intimidating at first but truly yogurt is pretty forgiving. Really, clean containers and utensils and mind your milk temperatures are the only musts. At first I would stress about how much yogurt for a starter, how long to hold the milk at 180 degrees and what if it went above 180?? What if I went longer than 10 minutes? And what is the correct temperature to heat it to? or cool it to? Everyone had a different answer… Well I have been at it about a month now…I have heated it as high as 200 degrees, and held it there for 10, 15, or 20 minutes…I use any combination of 2% whole milk, cream 10%, 18% or a splash of 32% (decadent yes), also I love coconut milk yogurt, love the flavour, have made yogurt using pure coconut milk, though that is pricey, but it is only the flavour that I am going for so I throw in a can of coconut cream, splash of cream and fill it up with whole milk…. delicious!! As a result of finding your blog today and your posts about using whey as a yogurt starter there is a coconut/whole milk yogurt on the go as I type … very excited about this because yes the whey weighs heavily on my mind…couldn’t resist. All I know is yogurt is so easy and the methods so vastly accommodating to what you have on hand that I should have been doing this long ago!! But seriously thank you for all the whey info, I will make good use of it! I tried making yoghurt in my Instant Pot for the first time today. Following your conclusions that 1/2 – 1 tsp is fine for a quart of milk, I went ahead and added 1 tsp to a litre of UHT milk. I warmed the milk first in a pan to the yoghurt level on my thermometer (around 100 deg), then transferred it to the scalded Instant Pot, and stirred in the yoghurt starter (I used Yeo Valley). Set it to the yoghurt setting for 8 hours and …… nothing! Literally nothing has happened to the milk. I have a pot of milk with a teaspoon of yoghurt in it and that’s it. Hi Teresa, I just had a similar experience using my Instant pot. I tried to make a gallon of yogurt using a half cup of starter. After nine hours of the yogurt has barely thickened. Were you able to eventually turn that milk to yogurt by adding more starter? Or did you have to throw it away? Hi Susan. I’m so glad it wasn’t just me then! Pleased to report that after adding another rounded dessertspoon of live yoghurt to the pot and leaving it for another 8 hours I had a pot full of yoghurt, which was lovely and thick after straining for a couple of hours! I purchased my Instant Pot a little over a week ago and have already made two batches of the best yogurt I have had. I actually used a recipe I found on Pinterest. I used a gallon of whole milk and two tablespoons of starter (oikos plain Greek yogurt). I incubated mine for 8 hours. I also strained my yogurt for about 8 hours in the fridge. I have never been so excited over a recipe. The yogurt is so much better than any store bought yogurt I have ever purchased, and much more cost effective! I have been making 1 qrt yogurt in a yogurt maker per your inputs – 1 tsp starter and leave for 8 hrs. Turns out beautiful consistency but after refregiration and usage, it turns runny? Mainly 1/2 the jar. Literally have to throw it out. I heat milk to 180 deg. Cool to 100 deg. before putting in cultures. I am using lactose free whole milk. Where am I going wrong during the process. The bacteria’s main food is lactose. You shouldn’t be using lactose free milk. I am somewhat lactose intolerant but can handle high quanities of greek yogurt just fine because the bacteria breaks down most of the lactose and most of the remaining lactose is drained off as whey. I’ve made several batches and am thrilled to see an actual experiment that shows what happens with different amounts of starter. Thanks so much for doing the work! For my last batch I did several things differently. (I know I should only change one thing at a time) and wonder about your thoughts. I used about 2T starter for a gallon of whole milk. The starter was some greek yogurt from a local company that makes ‘gourmet’ product. I have a new toy that allows me to heat and hold at a certain temp. I heated milk to 185 and held for about 45 min (doing other stuff). Then let cool and added culture, held @ 110 X 12 hrs. It was VERY thick and set – much thicker than previous batches from powdered culture. So differences must either be due to different starter or holding milk at scalding temp for awhile. Do you have any experience or opinion on extended scalding times and texture? I have not experimented with holding the temp high for an extended period. I don’t have the patience and don’t see the benefit, to be honest. Also, I find heating to 170 to be quite adequate. On a different subject, I usually incubate for only 4-6 hours. Incubating longer does not make your yogurt thicker, only more tart/sour. Some people like that but it’s not my preference. Hi, Paula! I landed here wanting to find out about using whey as a starter, and trying it riht now. Reading about time and temperature I came across a suggestion to heat the milk to over 200F, even to boiling, and keep it over 200F for ten minutes before culturing below 100F. I tried thar last time, bur cultured in IP Ultra at 104F, the lowest temp I could set in Custom. Same milk as always—non UHT, whole—and it was the best yogurt I’ve ever had, much less made! Worth the slight increased hassle, less whey after straining. I guess you’ve already figured out you can use whey as starter. I wrote about it here. If you surf the web you will find a million variations on making yogurt. It’s not an exact science as you know. I do not like to heat up the milk to 200F, but if it works for you, and you like the yogurt, keep doing it. I find that it can make a grainy texture sometimes. Some people claim there are health benefits to a higher temperature and like to hold it there for awhile. That’s lost on me. I don’t want to fuss with it. Keep in touch. I would love to know how you eventually decide is the best way to make your favorite yogurt. Interesting, Leanne. I can see that. I drain off as much as I can when it’s done. But if you don’t want to drain the whey, I can imagine how this technique would give you a thicker end product. I’ll have to experiment with that some time. Although I’m thinking the yogurt would be more tart if you don’t drain the whey. I prefer my yogurt mild but still, it’s worth a try. For a quart of yogurt I: heated half the milk to 180 degrees n saved in fridge till ready to make yogurt. Then heated other half to 180 then added chilled half. Presto now just add starter n keep at 110 degrees for 8 hours. It worked fine. I have been using the freeze-dried starter and would like to try using whey instead. 1- should the whey be refrigerated or stored in the pantry ? 2- if refrigerated, can it be use cold when mixing it in or room temperature ? 3- can it be frozen ? I like the idea of ready made ice cubes. 4- as an alternative, could I use a 7-10 day old yogurt that I made as a starter? Sorry if you have answered this elsewhere, I keep bouncing form page to page. I use a Thermos for incubation and large handkerchiefs for straining, ‘whey’ clearer than cheese cloth. 1. Whey is perishable. Refrigerate or can be frozen. 2. Yes,can be used cold. Well it works, one ice cube of whey for 2 quarts of milk. Incubation takes longer though, from 7 hours with the freeze-dried starter to 12 hours with the frozen whey. The taste, to my surprise, is not as tart, and to me, that’s a plus. I still strain it with a handkerchief for 45 minutes and that leaves me with 8 x 4oz jars. Thanks for the feedback, Laura. I would use more ice cubes of whey for quicker results. I’m used to incubating for only 4-6 hours. How much of powdered probiotic to think I could use in a cup or two of milk to make a starter? I have refrigerated bifidobacterium infantis. A high quality and highly concentrated. Thinking 1/4-1 tsp but I have not found an answer in all of my research today. Sorry Stephanie. I have no idea. I am fairly new to yogurt making but have been successful so far (beginner’s luck, I think! ), so I hesitate to deviate, but….I’m out of starter but I do have a jar of whey that’s about 4 weeks old. From what I’ve read in the comments, I can possibly use the whey as a starter….but how much? I’m making a gallon of yogurt (well, starting with a gallon of milk). Yes, you can definitely use whey. See this post. I would probably use 1/3 to 1/2 cup of whey for a gallon of milk. With some experimentation, you may find you can use even less. I recently purchased a yogurt machine and as per the instructions the ratio of milk to starter yogurt was 7:1. The yogurt did set but had a lot of whey and was grainy. I searched online and everyone said that its ok to have whey and grainy yogurt. Your post made everything so clear. I was using around 6tsp yogurt for every cup of milk. Now I use 1/4 tsp and it comes out perfect. I have tried with whole milk and yet to try with low fat milk. Let me thanks you as because of you now I can make yogurt at home and never need to buy yogurts with pectin and preservatives. Your welcome! My favorite comment this month. Thanks for writing. I’m very new to this yogurt making thing and twice now my questions/searches have landed me here for the answers. Thank you taking the time to detail the differences, this was really helpful! Loved your many experiments using different ammounts of starter and inoculation times and well documented. I have been making yogurt for years and have tried many different yogurt types as starter as well as temperatures and innoculation time. I actually use 1 cup of Fage greek yogurt to make a 8 cup batch. I built something that I connect to my yogurt maker that keeps the temperature at 109 -110 and innoculate for 13 hrs. My yogurt comes out thick with no straining needed. I am able to save a cup from each batch to start the next one. I can get 4 batches from this without having to start fresh. One thing that I learned about the 2 main cultures in yogurt is that they are anaroebic and one of them slowly dies upon exposure to oxygen. In order to resolve this problem, I use fermentation locks in the lids when storing my yogurt in the frig. The cultures continue to eat the food available and produce carbon dioxide which pushes the air out of the fermentation lock and keeps your yogurt fresher longer. I know that if you put in too much starter, the cultures all fight for it and you end up with weak cultures and runny yogurt. I think your experiments have been well done. This is a GREAT post! I appreciate you doing this experiment. It really helped me to SEE what I am doing wrong (adding too much starter) and knowing what to do to correct it. Thank you! Your site has been one of my main research tools for learning about this yogurt-at-home business, and I really appreciate how thorough you’ve been! I’d really like to make this yogurt in my crock pot, and the question of how much starter to use is my biggest issue right now. This post has helped a lot, as I would much rather use the least amount possible of store-bought yogurt for my first time, but every crock pot recipe I find says to use 1/2 cup of starter yogurt. Can you think of any reason yogurt made entirely in a crock pot would need more starter than the same yogurt that started out in the microwave or on the stove? I honestly can’t account for the difference unless it has something to do with how quickly or slowly the milk is warmed, but I’m just terrified enough of wasting a lot of ingredients that I don’t want to do the wrong thing! What do you think? Great information! 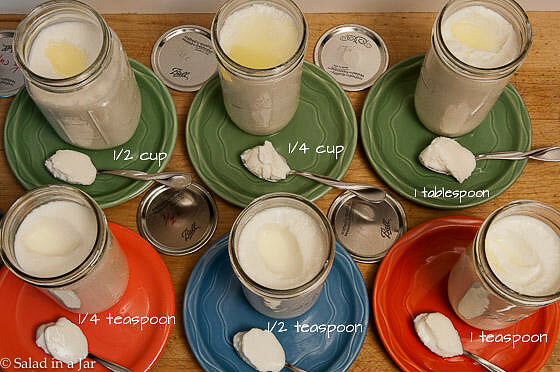 I just made my very first batch of yogurt & hit the Internet to determine how much starter to use. And it varied widely. After reading this, I used 1tsp per quart of milk, incubated in my Excalibur dehydrator, & it turned out PERFECT! Thanks so much! -What works well for me is using a stainless steel gallon pot. -Heat to 185 degrees with occasionally stirring with a flat edge pizza spatula. Then after cooling to 115 degrees add starter. -For $15 I purchased a sunbeam heating pad that I place the pot on and cover with a thick towel or small blanket. -The heating pad is set at LOW that maintains the temperate at 110 degrees. Thanks for sharing your method. The heating pad has worked great for me, too. Using less starter is wonderful news! I live in China and dairy products are very very expensive here to begin with (milk – $9 a gallon). The local store bought yogurt is very sweet and runny and sour cream and Greek yogurt really non-existent (unless you buy the uber expensive from the import shops). I have been making my own in a yogurt machine, but using the instructions that called for 1 cup of starter – so glad I can now use a much smaller amount and have better results, as I prefer thinker yogurt. This will save so much money. Hi, thanks for showing me how to make yogurt. The idea just came to me one morning, and uncle Google showed me your blog. 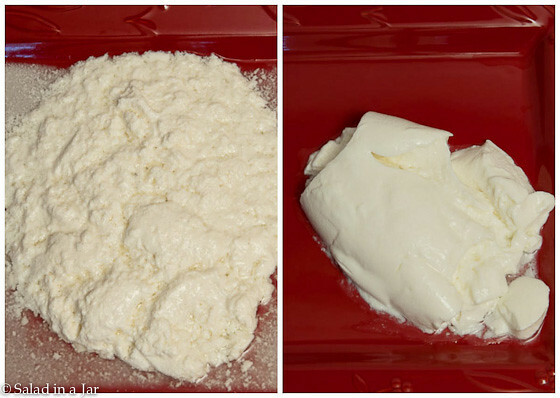 I haven’t tried it yet, but have you experimented with trying to use strained yogurt whey as starter? I’m just guessing that a lot of the cultures are probably still in the whey. Any reason you can think of why it wouldn’t work? Does it get tangier from 4 to 6 to 8 hours? Is it sweeter at 4 hours? Is the yogurt that set at 4 hours the least tangy and sweetest? Yes, it does get a little bit tangier but that may not be easy to discern in 6 or 8 hours. Sweeter at 4? I would say milder. A lot of the flavor of yogurt depends on your starter and the type and brand of milk you use. Different brands of yogurt contain different bacteria and this can make a difference. I have a favorite brand of milk I like MUCH more than any other. I just like the way it tastes. I want to thank for your excellent instructions. I just bought a yogurt machine and tried following their instructions. “Heat the milk until it begins to crawl up the side of the pan.” What a freaking disaster. The first time I got the pot to the sink before it boiled over. The second time I did it in the microwave with a pyrex bowl. Since they also used the word “boil” I used an instant read thermometer and heated it up in stages to 212. Pulled it of the microwave (bowl had a handle,, thank you God) and the milk surged up and everywhere. Fortunately I was able to get the bowl to the floor without dropping it and only burned a forefinger, slightly, but what a mess! It would be in the least accessible part of the kitchen. However, I found your blog, tried again using the instant read, voila! no milk eruption and using just a table spoon of the previous batch, instead of a whole jar as the machine instructions directed, I have perfect yogurt! Thank you so much for sharing your techniques. Thank you so much. Very interesting. i own a yogurt maker, but i made it myself out of an old plastic cooler and a lightbulb. i went to lowe’s and bought a cheapo lightbulb assembly and drilled a hole in the cooler and mounted the bulb inside on one end of the cooler. i put the jars of ready-to-incubate goodness in a big stockpot waterbath at the other end of the cooler. i also put a piece of aluminum foil around the side of the pot the gets blasted by the light so that that side won’t get hotter than the other. i had to experiment a bit with different wattage bulbs to get the temp just right. a 100-watter was just a bit too hot (116/117 degrees), and a 40-watt bulb was a bit too cool (105-ish). a 60-watt bulb turned out to be perfect, and kept four full jars and a surrounding water bath at a perfect 110 indefinitely. the lightbulb cooler method is awesome and makes great consistent yogurt every time, but there’s an even easier way to maintain temp that you might be able to use that you should try first: put a big flat rectangular plastic container with a lid (like one of those tupperware containers that’ll hold a bajillion cookies) filled with hot tap water (140ish?) on the bottom rack of your oven, then put the yogurt jars directly above it on another rack. ovens are basically big insulated boxes, so you should try this first. to test it, just use jars filled with 110-deg water and then test the temp of the jars every 30 min or so for a couple hours to see if it stays where you want it. if they cool off before your yogurt would have been fully incubated, reset the experiment and use slightly hotter water in the container. unfortunately i dont remember exactly what the temp of my hot tap water was back then, but i do remember that we had it turned up pretty hot and that once it got to temp you couldn’t put your hand under it without it burning you. also, i think that using plastic container for this was key because a metal container would maybe emit its heat faster and thus cool down faster. somehow the rate that it gave up its heat was just perfect to maintain the jars above it. but at any rate do try this in your kitchen because if it works then you’re set and you might not even need to buy anything! btw, don’t forget, when testing your oven, if you were to just test it after 8 hours or whatever, you won’t know if the temp went way up and then back down during that time. the jar temp could conceivably have shot up to 130 and then come back down to 110 by the time you tested it, so you need to test it in smaller intervals to make sure. years ago i had an oven/plastic container combo that, when the container was filled with water from the tap i had let run hot, would maintain my jars at 110 for at least 10 hours! it was so perfect. but for some reason i’ve never been able to reproduce it since. hence the cooler. my recipe: i use one gallon of whole milk (“red cap”) from the grocery, heated to 170-ish in a stockpot and then cooled back down to 110. i put about a cup and a half of the cooled milk into my meticulously just-cleaned blender jar and blend in one ounce of powdered milk (just the cheapo kind from the supermarket) and about one level tbsp of Dannon Plain for starter. i use the lowest blender setting and the pulse feature to ensure a good blend yet keep the foaming to a minimum. then add another two cups of milk, pulse once or twice to mix, and pour into jar. repeat for the other three jars. **one thing that i’ve become convinced is really significant, and may account for lots of beginners having weak batches that barely set up, is using a blender. yes, it does create some foam, which isn’t ideal. and the first time you make yogurt you’re guaranteed to make a mess of your kitchen counter. but if you don’t blend it, and just stir or even shake it up with the lid on, i think you don’t properly disperse that dollop of starter evenly throughout the quart of milk. i think it’s the dispersing effect of the blender that’s critical. just my theory, but i’ve never made yogurt i liked without a blender. Thanks for this post. 🙂 I am just now learning how to make yogurt and was confused on how much starter to put in. I have a batch incubating right now (my first!) and I think I might have overdid it with the starter. We’ll see what happens in 8 hours time…. Don’t worry. You can reduce it the next time if you went overboard. It will still taste good. next step will be to freeze it for a while, and see if it still works. Very interesting, Christopher. Have not even considered such an idea. I wonder how long it will keep. Thanks so much for sharing. I should tell you that I put plastic wrap on top of the plate, very tight, then spread the yogurt on it. The batch I ground is about a week old, and sitting on my counter covered tightly. Will update when I figure out how long it lasts. Thanks for this post, Paula, it’s really useful information. I have a question for other readers: do any of you use a Yogourmet electric yogurt maker? Mine works pretty well, although the temperature of the water bath, which should be about 110F, can vary, depending on the temperature in the room. I’d be interested in hearing about other people’s experience. The instructions call for far more starter than you use, Paula, and the incubation time is given as about 4 hours for regular (not probiotic) yogurt. That can give me chalky-textured yogurt, so I’m thinking I should reduce the amount of starter and go for a longer incubation time. Maybe someone who owns a yogurt maker will respond. Even if your water temp drops to 100F, you should have no problem with your yogurt. In regards to time of incubation, I suspect your yogurt will still make in 4 hours, even with less starter. Are you adding any dried milk solids to your milk before incubating? That can cause chalky-tasting yogurt, too. I usually use organic nonfat milk and generally don’t add dry milk to the mix. I’m wondering whether/how our altitude affects the process. We live at 7800′, and at this altitude, water boils at a little less than 198F. I have no idea what this might mean, if anything, to the recommended scalding temperature of 180F. Cooking here can be an adventure. By the way u did a great job there thanks. Please can i get a link to your bread recipes. That is another thing one can get addicted to. And cakes maybe? Miriam, For lots of bread recipes, take a look at my recipe index. It sure is addicting! Sometimes i purposely finish my starter so that i can rest!!! But making yogurt is fun really, there i go again……..
Just starting to make my own yoghurt– this is so helpful, Paula! Thanks also to others for mentioning slow cookers, which sound useful and practical. This was a truly fantastic post. Thanks so much for writing it. I’ve tried and failed to make yogurt in the past….I think I’ll give it another go. Thanks again. You’re welcome Dana. Hope it works for you next time. I was not thrilled with my first attempts but as I experimented with different starters, milk, and incubation techniques, it got better and better. Happy yogurt making! Interesting, even though I buy my yogurt at the grocery store. GREAT post, Paula! You put in a lot of time and effort to make this all so clear. I just checked to find a location near me for the milk you use and there are none close by. My yogurt comes out a little thinner than I prefer and the quantity after draining off the liquid for Greek yogurt is much less than I would hope for. Lately, I have been buying yogurt from Aldi. I’m with you Lorraine. I wish the half gallon of milk made more greek yogurt. That type of milk is not sold in Michigan. I’m going to search for something similar because I just use regular milk. So this explains a lot as I’m a ‘if a little bit works a lot will work better’ type of person. So if I understand this correctly this would explain why I have so much whey when I drain my yogurt for greek yogurt? I do mine in a container and micro like you, and then wrap it in a beach towel and place back in the warm micro overnight and there *is* whey sitting on top every time. After I strain it I feel I have almost as much whey as I do yogurt but didn’t know why! Thank you for all of this very scientific and hard work to explain this!!! Yes, too much starter could be the problem. However, there are other variables as well. The kind and brand of milk you use has a lot to do with it as well as the time of incubation. But try less starter and see if that doesn’t help. Mine never has whey sitting on top before I disturb it, however I can still strain a lot of whey and yes, there may be just as much whey as yogurt. That’s one reason why Greek yogurt is more expensive in the store. It takes more milk for the same amount of finished product. Wow, Paula! This is a great post with a lot of helpful information! I made a batch of yogurt a while back to see if I could make it in my new thermal cooker. Thanks to your previous posts, it was a success. A thermal cooker is a little like crock pot cooking, but you don’t keep it plugged in. It slow cooks for up to 8 hours and is completely portable. On my first batch of yogurt I tried just four hours in the thermal cooker and it worked. What is nice about the unit is that you can choose either to put your milk mixture in mason jars (the size of the jar does not matter), or you can simply put the whole mixture in the inner cooking pot, leave it in there for the desired amount of time, and then strain the whole batch before putting it in smaller containers. Since the thermal cooker is insulated, it keeps the yogurt at the ideal temperature range for incubation. Thermal cooking is very popular in Europe and Australia. It is just now really getting started in the US market. I purchased mine because it is ideal for emergency use because all you have to do is bring your food up to a boil (from a camping stove or rocket stove) and then it continues to cook for up to 8 hours without additional power. But even when there is not an emergency, the thermal cooker can be used every day and you just use your regular kitchen stove (gas or electric). It’s great because you don’t have to heat your kitchen up in the summer, you can cook while you’re not at home and nothing is left plugged in (like a crock pot), and it is completely portable. You can take it on the road with you and it will cook while you drive. You can take it camping, hunting, tailgating, etc. and have a meal ready to serve piping hot hours later. And it is IDEAL for making yogurt! I love when I find products with multiple uses and various applications. Thanks, Paula, for experimenting for us! It seemed that 4 hours was enough time, but since I am new to making yogurt (and actually have never eaten it), I wasn’t sure I was doing it right! I now have more confidence to keep going. I just looked on Amazon to see what people are paying for yogurt machines. They are mostly in the range of $50.00 – $100.00. And most of them just make yogurt. A few do ice cream. For about $100.00, one could get a thermal cooker (I recommend Saratoga Jacks) and have an ideal yogurt maker, a slow cooker, and even a cooler (the insulating properties keeps cold food cold). AND it is ideal to use for emergency use when your home loses power. I use a Progurt machine and 2 tbsp of regular store bought yogurt (plain and sweetened) and it always makes a perfect creamy batch of yogurt overnight.. however.. Whenever I freeze a portion to use as the starter for the next batch (perhaps a bit more than 2 tbsps) , the ‘yogurt’ comes out watery and not at all creamy, despite 12 hours of incubation! Not sure if it’s the freezing of the bugs or the bit larger amount of starter. Last time, I tried using the frozen sample, plus a couple tablespoons of fresh store bought yogurt, but surprisingly, I still got watery kefir like yogurt. Are you freezing store-bought yogurt? I wonder if there might be some additive in there that doesn’t react well to freezing. Have you tried freezing a small amount of your own yogurt to use as starter? Mine always works great. (i make my yogurt in the crockpot) I tried freezing like 3/4 cups of my first batch of homemade greek yogurt. when i used it as a starter it didn’t work at all. i think, due to the hot summer, i might have killed off the cultures while it thawed. after about 9 hours it looked a little thick but ran right through my bouillon strainer. i have made a few since then, without freezing my starter, and they have turned out well. i do not measure the starter but i use like a heaping tablespoon. great experiment! very informative. i will now cut down on my starter. my last batch of yogurt was super super thick! i didn’t whip it at the end like your youtube video says because i use my yogurt for smoothies. since its going in the blender no need to whip. thanks for such great post! Sorry about your frozen starter. 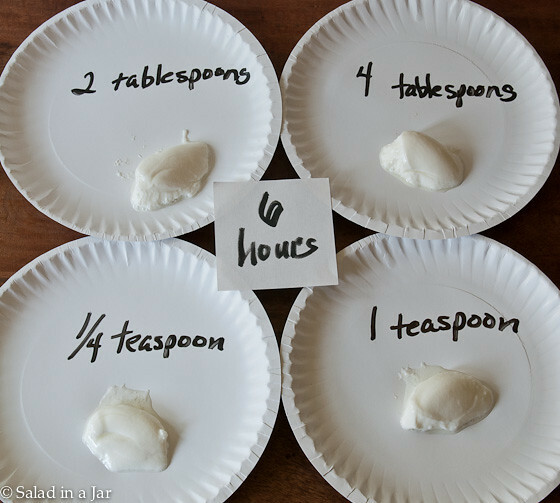 It works great for me and is a wonderful trick to keep in your back pocket when you go on vacation or take a break for making yogurt for awhile. About the whipping, I agree that if you are using it in smoothies, you probably don’t want to whip or drain. Sounds delicious and nutritious. Thanks so such a quick reply! I think I will try freezing again and just thaw in the fridge for a while. We have a little heat wave going and I think it messed up my last batch. I think I will wait til Michigan cools down before I make more. I’ve only made a few batches and I’m enjoying the learning process. Thanks so much for the help! read my post, if you would please. Might help you. If you get the crumbly texture, put the mess in cheesecloth to drain at room temp for a day (or two), add a small amount of salt, and then refrigerate. You have delicious, very inexpensive creme fraish.